So here it is. 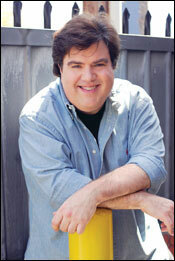 My interview with Dan Schneider! I’d say you have the coolest job ever (besides pilot). How did you get your job? Well, I used to be an actor. I did a popular TV show and I also acted in a few movies. Then, while I was between acting jobs, a friend of mine asked me to help him make a TV show for Nickelodeon. Since I wasn’t busy acting, I said “Sure.” That show was called All That and ran on Nickelodeon for 10 years! I really liked writing and producing, so I kept doing it — mostly shows for Nickelodeon. iCarly is my 6th TV show for Nick. And I’m working on making a 7th one right now! What is your favorite TV show you have ever done? That’s a very hard question. Every new show I make is like my own child to me. So, asking me my “favorite” show is like asking a parent to pick a favorite child. I like all my shows for different reasons. But I will say that I love Drake & Josh a whole lot. I know that right now you are doing iCarly. I give iCarly 107 gold stars! What is the progress on iCarly? Have you filmed the whole first season? I absolutely LOVE making iCarly. Some people think it’s the best show I’ve ever done. It’s going great. It gets very good ratings, which means it’s popular. And yes, we have finished the first season which was 25 episodes. Nickelodeon has already asked me to make another season. So everything with iCalry is going GREAT. I like the episode of iCarly is the one where they have a contest to get more viewers. What is your favorite episode of iCarly so far? Wow, you ask tough questions! Hmmm… well, first I have to say that I love all the episodes. I don’t think we’ve made a bad episode yet (I hope not). But my favorite? I don’t know. Maybe the one with Nevel? It’s really hard to say. I really do love them all! When is Drake and Josh in New York going to be out? I know that on IMDB.com it says that I’m working on a movie about Drake & Josh in New York — but that’s not true. However, I am planning on a new Drake & Josh movie. Unfortunately, I can’t talk about it right now because it’s a SECRET. All I can say is this: there is definitely a new Drake & Josh movie being planned. And we’re all going to work really hard to make sure it’s awesome! Do you like writing, producing, or acting better? Yikes! I feel like I keep saying this, but I love all three: writing, producing, and acting. It’s sort of like asking me, “Do you like pizza, ice cream, or hamburgers better? I love them all! I truly love writing AND producing AND acting. My friends (some of them are VERY funny). My wife Lisa (she’s super funny). Also great comedy movies. And TV shows like the Simpsons. And my family. I read somewhere you were from Memphis? Do you like Hollywood or Memphis better? Memphis will always be my home town, so I’ll always love Memphis — that’s where I was born and grew up. Los Angeles has been my home now for more than 20 years, so this is home, too. I really enjoy living in Los Angeles. What is the worst thing you ever did as a kid? What is your favorite flag from the world? That’s an easy one. U.S.A. all the way!!! Go America! I like to collect airplanes. What are your hobbies? I like computers, cool electronic gadgets, music, cooking, swimming, and awesome cars. My favorite flower is the same kind that is my dad’s favorite: ORCHIDS. Yes. I’m pretty good with voices and stuff. I do a lot of funny voices. I can sing a little, but not that great. I guess I’d say I’m pretty good at comedy. What is the most disturbing thing you have ever seen? I once saw a kid pick a scab off his arm and eat it. That was disturbing. Oh, and once I drank a soda (in a paper cup), and at the bottom of the cup was a big dead bug. I screamed. Bunny rabbits. Specifically, small lops (that’s a special kind of bunny). I also love dogs and cats… and ALL ANIMALS. I’m a big-time animal lover. I always tell everyone how important it is that we humans always be nice to animals. wow! big score for you!!! what a great interview! Dang Matt! This was so awesome! I love this guy and you got to meet him and do an interview! WAY! Great job! do you seriously love icarly? or do you love her or the show? just wondering ok? i love icarly the show not her in person but then again i am not a guy like you. you are a guy right? Woah that’s so awesome! How did you manage to get an interview with him?